Seems like a great deal nearest price seems to be £329 on Play. This is one of those all singing and dancing all in one systems tranforming from carry cot to stroller. Doesnt come with car seat cheapest I can find this for is £99.99. Instore was a Babys R Us catalogue that had a voucher for £10 off travel systems over £200. Please post any better value travel systems if you come across any! The new Graco Symbio B pushchair in Urban easily converts from a lie flat pram to pushchair, avoiding the need for a separate carrycot and also reducing storage requirements. The unique, reversible handle can be switched quickly and easily with one hand. Compatible with the Logico S HP car seat (ref: 759201, sold separately) to create a one-click travel system. 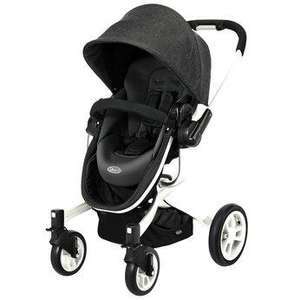 I have this pram in the Boysenberry and it is lovely - I recommend it!! I got it from Babies R Us and paid around £320 from memory for the pram plus carseat but I got it on offer and traded in an old carseat to get a further discount. In my opinion though - this is a great price for a great pram! 20% off coupon doesnt work with this item at checkout? Just Purchased this Pram yesterday in Boysenberry Colour. In store price was £249.99 that even included the rain cover and car seat adapter. Babies R Us were selling the baby seat for £99.99 separately. I told them I seen the same seat in Halfords for £60, and they Priced matched it. Also in their catalogue there are vouchers, I managed to get a further £15 reduction, the lady at the checkout was fantastic and scanned two vouchers and minused it off the total price. Its probably the best all in one system I have seen, and at just under £300 for the whole lot, it definately leaves the other prams behind not only in looks/build quality/functionality but price.